Guru Arjun Dev, the fifth Guru of the Sikhs, was a man of great vision and ideas. He succeeded Guru Ram Das in 1581. 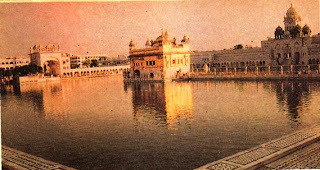 He resided mostly at Amritsar and made it the headquarters of his mission' He continued the work of the excavation of the holy tank at Amritsar started by Guru Ram Das. Dev built the Golden Temple in the centre of the pool. The Guru requested the great contemporary mystic and pious Muslim saint Hazrat Sai Mian Mir, to lay the foundation stone of the temple in January 1589. With the laying of the foundation stone the construction work started briskly. The building of the temple was completed in 1601 and Sri Guru Granth Sahib was installed there in 1604. Baba Buddha was appointed as the first Granthi i.e. the priest of the noty scriptures. ln 1606, Guru Arjun Dev was martyred. This caused a great resentment among the Sikhs. The next Guru, Guru Hargobind, organised an army for the first time on a systematic basis. Though a child of only eight years, he laid the foundation of-the Akal Takht. At assemblies there, orders from the Guru were proclaimed. Seated on the Akal Takhat, the Guru told Bhai Buddha that henceforth he would wear two swords, one of 'miri' and the other of 'piri', those of the temporal and the spiritual power respectively. Hence he preached the name of God to the vast gatherings which came for his 'darshan'. Occasionally, he would also go on hunting' expeditions. During his absence, Bhai Buddha organised the singing of hymns in Hari Mandir. When Guru Hargobind proceeded to Delhi in 1612, he said : "The Hari Mandir is devoted to God's service and it should always be respected. Gambling' drinking and molestation of women should not be allowed therein. No one should steal, utter falsehood, smoke tobacco or contrive or conduct litigation in its precincts". The seventh Guru' Guru Hari Rai and the eighth Guru, Guru Hari Krishan remained most of the time at Kiratpur. When Guru Tegh Bahadur visited Amritsar to take a bath in the holy tank, he was not allowed to enter the precincts of Hari Mandir by the ministrants of the temple. 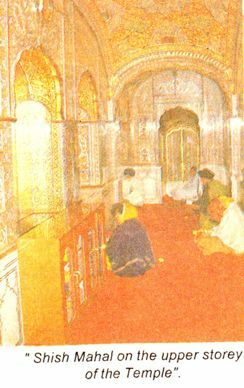 The doors of Hari Mandir were barred to him. He bowed his head from outside and rested at a spot where a platform was later built. After the martyrdom of Guru Tegh Bahadur, the entire course of Sikh history changed. Guru Gobind Singh had to take to arms to fight against tyranny and injustice. He spent most of his time at Anandpur and did not have any occasion to visit Amritsar. The temple, however, had a chequered history and it changed hands a number of times. The Sikhs were turned out of their temple and the temple itself was destroyed and desecrated many times by the Muqhal rulers and Afghan invaders. Its control was regained by the Sikhs after many sacrifices. The history of those days connected with the temple reads like a great saga of bravery, heroism and valour for protecting it from the onslaughts of tyrants. In 1738, Bhai Mani Singh' a pious man, responsible for taking care of the temple was martyred at Amritsar. He had once applied to the administrator of Amritsar for holding the Diwali fair. The permission was granted by Zakariya Khan' to whom the matter was referred on the specific condition that Bhai Mani Singh would pay five thousand rupees to the state for holding the fair. Bhai Mani Singh announced the celebration and the Sikhs started coming from all over in large numbers' Zakariya Khan sent a company of troops-on the pretext of maintaining law and order. This created panic among the people and the fair could not be held. So Bhai Mani Singh did not pay the agreed amount' At this the authorities were enraged. Bhai Sahib was arrested and removed to Lahore, where he was asked either to pay the promised amount or to embrace Islam Bhai Mani Singh refused to pay the amount and his body was cut into pieces bit by bit. This created a great resentment among the Sikhs. 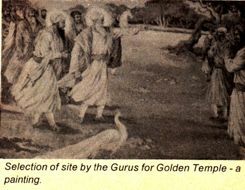 Two stalwarts, Mehtab Singh and Sukha Singh, could not tolerate the desecration of the Golden Temple by Muslim officers who were holding "mujras" in the shrine" They came from Bikaner in the garb of peasants with bags full of coins and appeared before Massa Rangarh "officer-in-charge.' Their swords fell on Massa Ranghar who was put to death. Later, these warriors were killed mercilessly. The temple was locked and sentries were posted on the entrance with the strict orders of not allowing anybody inside. The Sikhs, however, did not lose heart. Nadir Shah invaded India in 1739. Sardar Jassa Singh Ahluwalia, a prominent Sikh leader of the time, took advantage of the confusion and anarchy which followed the attack. Ahmed Shah Abdali's invasion in 1747 brought about a new era of persecution of the Sikhs. He was determined to wipe out the Sikhs and destroy the Golden Temple. He occupied and desecrated the temple in 1757. On hearing of the desecration, some Sikhs vowed to avenge the insult under the command of Baba Deep Singh. A bloody encounter took place about 11 kms. from Amritsar. But the Sikhs made a clear headway. When they were still about 7 km. from Amritsar, Baba Deep Singh was mortally wounded. As he was about to die, a colleague reminded him of his vow to reach the holy precincts. On this, he gripped and supported his severed head with his left hand and with the sword in his right hand he went on mowing down the enemies, and at last he reached the Golden Temple. His pledge fulfilled, he threw his head from a long distance into the circular track around the temple. Near the spot where his headless body fell, stands a shrine called Gurudwara Shaheed Bunga Baba Deep Singh erected in the memory of the great hero. Ahmed Shah Abdali was not the man to let the challenge go unanswered. He again invaded India in 1762 and inflicted a deadly blow on the Sikhs in the battle of Kup Rahira near Ludhiana. This is known as Wadda Ghalughara or the Great Holocaust. On his way back to Kabul he invaded Amritsar. The Golden Temple was blown up with gun-powder and the holy pool was also desecrated. Countless Sikhs laid down their lives in defence of their shrine. After Ahmed Shah Abdali's final departure from India in 1767, the Sikhs re-conquered Punjab and occupied the Golden Temple which was reconstructed. The holy pool was cleared of the debris. ln 1802 Maharaja Ranjit Singh attached the city to his empire. He then entered the holy temple, bowed his head at Hari Mandir and performed his ablutions in the holy tank. During Maharaja Ranjit Singh's reign (1780-1839), a council of Sikhs, headed by the Maharaja himself, was appointed to manage the affairs of the temple. The council functioned as long as Punjab remained a sovereign state. 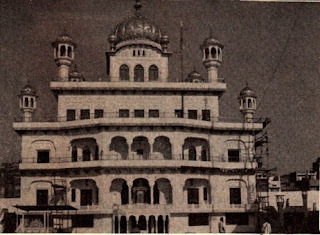 During the British regime, the Golden Temple passed under the control of one man; the Sarbrah (manager), who was the nominee of the Deputy Commissioner of Amritsar. These managers mismanaged the affairs of the temple. Immoral acts were practised within its precincts. Great resentment prevailed among the Sikhs. They grew restive and a Sikh Gurudwara Reform Movement was launched. The campaign was directed mainly against the control of Sikh shrines by the Mahants and the British rulers. The struggle finally resulted in the passing of the Sikh Gurdwara Act which vested the control and management of the Golden Temple and other historic shrines in the Shiromani Gurdwara prabandhak Committee (SGPC). When the Sikhs asserted their supremacy, the holy pool and the temple were not only restored to their original splendour but the place also grew in beauty. Maharaja Ranjit Singh beautified the temple with gold-work, marble in mosaic and fresco-paintings. The lower-half of the temple was decorated with white marble, in-laid with precious and semi-precious stones like the jade, carnelian, lapislazuli, mother of pearls, agate, jasper, solidified quartz, limestone and black and brown marble. The upper half was covered with gold-plated copper. Maharaja Ranjit Singh, who was a great lover of art and beauty, adorned the temple with mural paintings and cut-clay work and enriched it with valuable material. Inspired by a holy zeal, he addressed his attention to the beautification of the temple. The temple is 40.5 ft. square and is erected on a platform of about 65 ft. sguare. lt is a two-storeyed structure over which rises a low-fluted dome in gold metal and has kiosks with fluted metal and cupolas at each corner. There are four doors, one on each side, signifying that people from all directions, irrespective of their religion, nationality, caste or creed, are welcome. A fine archway called the Darshni Deorhi stands at the shore-end of the causeway. The door-frame of the arch is about 3 metres high, 2.5 metres wide and more tlran 15 cm. thick. The doors are covered with silver sheets and panels and are decorated with artistic ivory in-lay work at the back. About 19 metres wide promenade called the parkarrna (the circumambulatory track runs around the pool. Every centimetre of this track is decorated with different varieties of marble. A beautiful causeway is the only way leading to the main shrine. lt is a lovely approach bordered by perforated marble balustrades making screening on both sides and coloured lamps with elegant gilt lanterns are fixed on marble pillars erected at close intervals. The walls of the ground floor of the temple are 'faced' with marble slabs laid-in with arabesque of conventional flower sprays: invaluable stones of various colours and shades green, grey, red, pink, blue, black, yellow and white etc. Some stones have stripes and some others are double coloured. ln-laid work is so exquisite that at some places more than a hundred pieces of stones have been set only within a space of 9 to '1 1 sq. cm. to make elegant mosaics. The outside walls of the upper storey, the cornices, the roof, columns, cupolas, in short, almost every centimetre of available space, with the exception of the floor, are a shimmering mass of 'gilded copper in different shades and patterns. 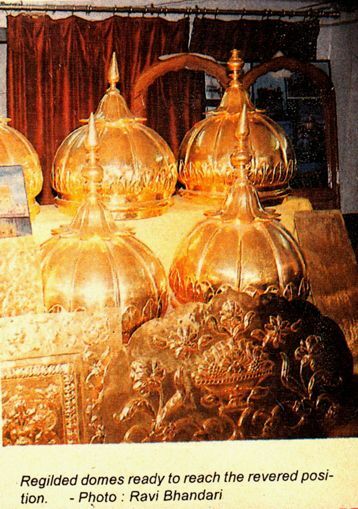 The eastern loggia of the temple are covered with copper plates gilded with gold, donated by Rani Sada Kaur, mother-in-law of Maharaja Ranjit Singh. The remaining three sides were similarly beautified by the Maharaja himself. Decoration work at other places in the temple was got done by the Maharaja, his son Kharak Singh and his grandson Naunihal Singh. There is a small Shish Mahal on the upper storey which originally was the pavilion used by the Gurus. lt was beautified by Maharaja Ranjit Singh with mirror and glass pieces set in clay, and was painted in diverse colours, including the golden one. This place is now used for Akhand paths. Hymns are inscribed on its walls and arches in letters of gold with red, blue and green background. On the third storey stands the gorgeous golden dome surrounded by dozens of similar domes and kiosks. The interior of the temple is richly decorated with floral designs, painted in tempra or embossed in metal. There is a skilful harmony of brass and gilded copper, cut clay work with mirror pieces with different shapes and stones set in. ln the Golden Temple all the characteristics of the Sikh style are fully represented. The frescoes executed on the temple walls are different from those of the Ajanta and the Ellora caves. As for the technique of these frescoes it marks the beginning of a new era in this particular branch of painting. These murals were done on walls even as the plaster was wet. The pigments used were indigenous and were mostly prepared under the personal supervision of the artists. They were derived from stones, earth, leaves, flowers, charcoal, oil smoke and some other sources. The colours obtained are known as Lajwar, Hurmchi, Kajal Kala Sandhur, Shingraf, puri, and Sange Subz prepared from mustard oil burnt in earthen lamps. These pigments speak eloquently of the great skill and ingenuity of the artists as also of their tremendous patience and labour. 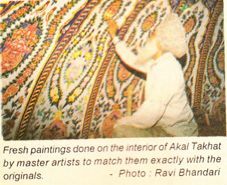 This technique of fresco paintings is known as Mohra Qashi. The artists drew their inspiration from nature. They selected floral patterns and animal figures for their motifs. Of course, occasionally human figures have also been displayed. The different units of a pattern are so fashioned that they produce the effect of a unified and integrated whole. There are about three hundred patterns on the walls which from a distance, give the illusion of fabric prints, Kashmir embroidery or Persian carpets hung on the walls. These paintings not only appeal to the sense but also create spiritual vibrations and stirrings in the minds of the beholders. The architecture of the Golden Temple represents a happy blending of the Hindu and Muslim artistic traditions. lt is, in fact, more than a mere combinaiion of the two and marks the beginning of a new school of temple architecture in India. Located in the heart of the city the Golden Temple is a source of eternal bliss and spiritual light to innumerable devotees and visitors who come here at all hours. They visit it all round the year and they come not only from the city itself or all over the country, but distant and different parts of the globe. Here is a thing of exquisite beauty which also provides the holy spiritual bliss to those who come to pay their obeisance here. As Bhai Vir Singh, the great poet, said "Here plays the divine grace, like a wave rising upon a wave, flooding the heart of the devotees with a new joy, hope and peace". .ln 1762, Ahmed Shah Abdali blew up the Harimandir Sahib with gun powder. The Sikhs rebuilt it in'1767 A D' Maharaja Ranjit Singh gilded the emple with l65Kgs. Of gold at a cost of Rs.65 lakh in those days. The entire renovation and gilding work was completed in 25 years in '1830' The gold had since started blackening and a U.K. based organization Guru Nanak Nishkam sewa Jatha has undertaken these wa of regilding the upper portion using leaf gold (waraq) weighing about 500 Kgs of 24 carat and the sewa is to be completed by April 13, 1999. surprisingly the present technique of goldel ectroplating has been discarded against the traditional waraq pasting technique which has comparatively longer life.It is expected the present gold layer will last for 300 years or even more'. The Maharaja got the gilding work done from Mistry Mohd Yar Khan while the present historical work is being done by artisans drawn from Muradabad, Varanasi etc. Bullet. 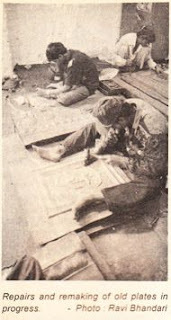 Marks of 1984 operation Blue Star are also being removed from the walls of theTemple.Gilding work is done in such a manner thal the original carvings and floral designs are preserved intact. In 1984 Mrs. Gandhi, ordered the storming of the Golden temple complex. Military strategists agree that with a siege or, use of lethal, non-lethal gas the militants could be demobilized, smoked out and the destruction avoided. Akal Takhat a symbol of the highest seat of Sikh temporal power was badly damaged on June 5, 198'4. 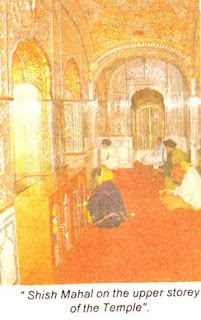 Maryada, the daily practice, has been restored from April 13, 1997 after the re-construction of the Takhat was completed.